This guide describes how to delete an end user or agent in Zendesk Support to meet your obligations under the General Data Protection Regulation (GDPR). GDPR is a European privacy regulation that aims to strengthen the security and protection of personal data of citizens of the European Union (EU). In this article, users can be end users or agents as the terms are defined in the Master Subscription Agreement. You should delete an end user or agent only as the last step in the workflow for deleting personal data. The order of the tasks is important because you need the user's profile data to find their personal data in tickets and in other resources. If you permanently delete the user first, finding their personal data will be more difficult. Delete personal data in ticket conversations. Delete personal data in Zendesk Guide, Zendesk Chat, or Zendesk Talk if you use any of those products. Permanently delete the end user or agent from Zendesk Support. 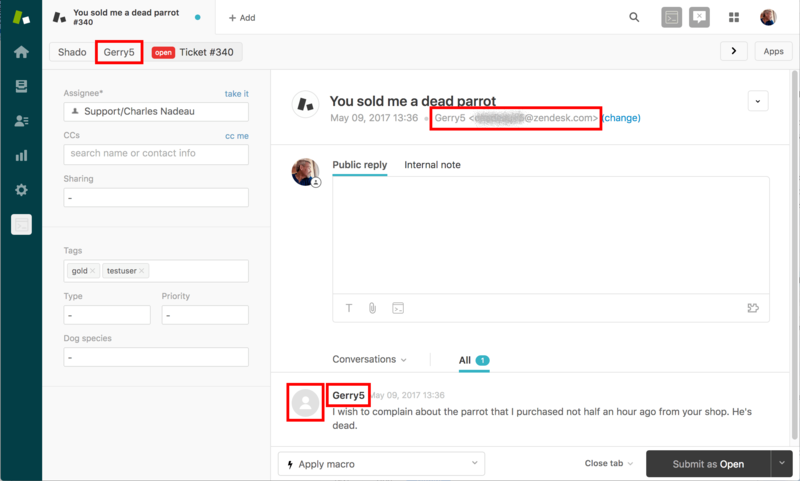 Replaces the user's name in any system field with the placeholder string "Permanently Deleted User"
Deleting an end user or agent in Support has no effect on the imported users or product users in Zendesk Connect. The two products don't share users. Any user id in the record is not traceable to an actual person if that user has been permanently deleted. See Permanently deleting the end user or agent. The first step is to find personal data in ticket conversations and then delete it. A ticket conversation consists of all the comments on the ticket. You have several options for deleting the data, including redacting strings in the conversation and deleting the ticket itself. You might not be able to delete certain data from a ticket conversation. In particular, closed tickets can't be edited and the bulk of your tickets might be closed. You'll have to delete those tickets. At this stage, you can ignore any personal data in the ticket that the system retrieves from the user profile, such as the requester's name that appears in the ticket locations in the following screenshot. The data will be replaced with the placeholder string "Permanently Deleted User" when you delete the user in the last step of the workflow. You need a list of possible search terms to find the user's personal data in ticket conversations. You can get the initial search terms from the user's profile in Zendesk Support. In the agent interface, click the Search icon ( ) in the upper-right of the top toolbar and search for the user's name or other identifying information. On the results page, switch to the Users tab and select the user to open their profile page. Go through your list of search terms to find personal data in ticket conversations. Note: Inline images, attachments, and call recordings may contain personal data that isn't searchable. Make sure to manually check any image, attachment, and call recording in the tickets in your search results. In the agent interface, click the Search icon ( ) in the upper-right of the top toolbar and search for each of your search terms to find tickets that contain the information. Select a ticket from the results and review the conversation, including any inline images, attachments, and call recordings. If during your review you discover other identifying information that your organization defines as personal data, add it to your search list. For example, if you find out that the user included their home address in a comment, add it to the list. Note: Your organization decides what is personal data. Confirm that the personal data in the conversation belongs to the user. Make sure to positively identify the user before deleting data. The conversation may be referring to another person with the same name or alias. If the ticket is closed, permanently delete the ticket. There's no way to redact information in conversations of closed tickets. See Permanently deleting tickets. If the data consists of a string in the conversation, redact the string. See Deleting personal data in ticket conversations. If the data is in an inline image or an attachment, permanently delete the ticket. See Permanently deleting tickets. If the data is in a call recording, delete the call recording. 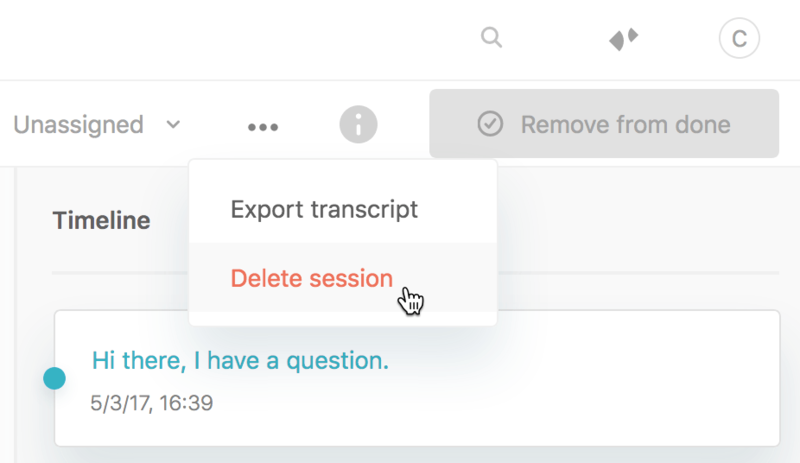 See Deleting personal data in call recordings. Note: The Ticket Redaction app has limitations when used with rich text or languages containing non-ASCII characters. The app completely deletes the string from Zendesk databases but it doesn't purge it from any existing logs of when the ticket was originally created. The logs are automatically deleted after a period of time. The app can redact links to inline attachments but it doesn't delete the attachments themselves in the system. You must permanently delete a ticket to delete the attachments. See the next section. Similarly, the app can redact phone numbers in strings but it doesn't delete the phone numbers used as identities in the system. To download and install the app, see Ticket Redaction app in the Apps Marketplace. Both administrators and agents with delete permissions can delete tickets in the agent interface. Deleted tickets are moved into a Deleted Tickets view, where you then permanently delete them. Agents must have permission to delete tickets. On Essential, Team, or Professional, click the Admin icon ( ), select Settings > Agents, then click Agents Can Delete Tickets. On Enterprise, you can allow agents to delete tickets based on their custom role. 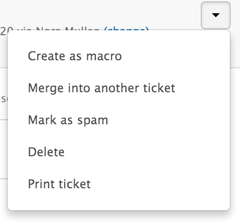 With the ticket open in the agent interface, click the options arrow in the upper right, then select Delete. If you want to delete more than one ticket, select multiple tickets in the search results, click the arrow icon on the Edit tickets button on the upper-right side, and select Delete. When prompted, click OK to confirm the deletion. The tickets are deleted and moved to the Deleted tickets view. The next step is to permanently delete them. Click the checkbox beside the ticket or tickets you want to permanently delete. Click the options menu in the upper right, then select Delete ticket forever. Click Delete ticket forever again to confirm that you want to permanently delete the selected tickets. You can use the Zendesk API to find and delete personal data in ticket conversations. If the ticket is closed, permanently delete the ticket. There's no way to redact information in conversations of closed tickets. If the data consists of a string in the conversation, redact the string. If the data consists of an attachment in the conversation, redact the attachment. If the data is in an inline image, permanently delete the ticket. 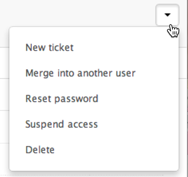 Note: Deleting an end user or agent in Support has no effect on the product users or imported users in Zendesk Connect. 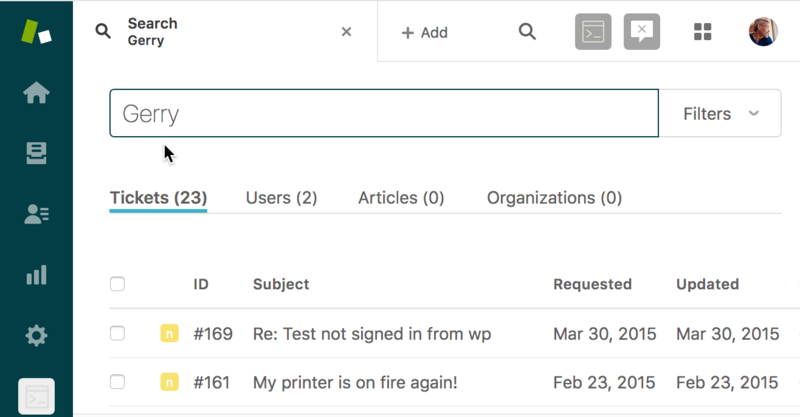 If your organization receives a request to delete a user from Connect, send an email to support@connect.zendesk.com requesting the deletion of the user's data and their user journey from Connect. The data is permanently deleted. Personal data may be contained in articles, posts, and comments in Help Center. Create a list of search terms, as described in Creating a list of search terms. Use Help Center search to find the personal data in the content. Confirm that the personal data in the content belongs to the user. Make sure to positively identify the user before deleting data. The content may be referring to another person with the same name or alias. Articles Delete the article. You must archive the article first, then delete the archived article. The procedure soft deletes the article, making it unavailable for everyone including Guide admins through the UI or the API. The article will still be in the Zendesk database and accessible on a limited basis to employees with certain database privileges. Soft deleting the article will also soft delete any inline and block attachments. See Deleting an article from your knowledge base in the Guide docs. Simply editing the article to remove the personal data is not enough. On the Professional plan and higher, the data is maintained in the system to show article revisions and history in the Guide interface. You can create a new article that doesn't contain the personal data. Community posts Edit or delete the post. Deleting the post soft deletes it, meaning it's no longer accessible by anybody, including admins, in the Guide interface. Any comments and inline attachments associated with the post are soft deleted too. The attachments will no longer be accessible through the URL. See Editing and deleting community posts and comments in the Guide docs. Comments Edit or delete the comment. Deleting an article or post comment soft deletes it, meaning it's no longer accessible by anybody, including admins, in the Guide interface. Any inline attachments associated with the comment are soft deleted too. The attachments will no longer be accessible through the URL. Chat transcripts in Zendesk Chat may contain personal data. An end user may also have a visitor profile in Chat. The visitor profile is not deleted when you delete the end user in Support. Chats may contain personal data. Images and attachments in chat transcripts might have some too. From the dashboard in Chat, select History. In the History tab, search for the items on your search list. Select a chat from the results and review the transcript, including and image or attachment. Confirm that the personal data belongs to the user. Make sure to positively identify the user before deleting data. It may refer to another person with the same name or alias. Images and attachments Delete images and attachments in chat transcripts. Chats Permanently delete the chat. An end user may have a visitor profile in Chat. However, deleting an end user in Support doesn't delete the end user's visitor profile in Chat. Delete all the chats involving the visitor. Only admins can delete a message conversation. In the dashboard, click the Done Conversations icon in the left sidebar. Select the conversation to delete, then select Delete session from the extended (...) menu in the upper-right side of the page. If you use Zendesk Talk, personal data may be contained in call recordings. 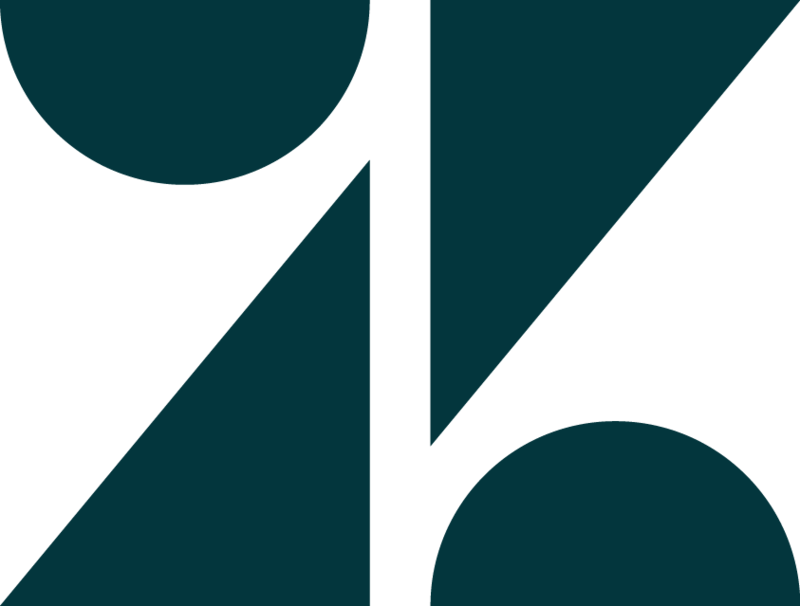 The call recordings are included in tickets in Zendesk Support. You can delete call recordings from tickets as described in this section. Call recordings are also deleted if you permanently delete a ticket. See Permanently deleting tickets. The recording is soft deleted at first, then hard deleted automatically 7 days later. The call recordings are also deleted from Zendesk Talk’s service provider Twilio. The data that Explore stores for analytics purposes may contain personal data. Explore replicates this data from upstream products such as Support, Talk, Chat, or Guide. To delete the personal data, delete the information in the upstream products. See the instructions for each product for details. It takes up to 24 hours for corrections to be reflected in Explore. You can't delete an end user or agent who's a requester on a ticket that hasn't been closed yet. See What is the difference between a Solved ticket and a Closed ticket? First, the ticket must be solved before it can be closed. Second, the solved ticket must be closed by a trigger or an automation. The ticket can't be closed directly in the agent interface. To close the ticket immediately, you can create a trigger for the specific purpose of closing the ticket. For details, see the tech note How can I manually close a ticket? Both agents and administrators can soft delete end users or agents in the agent interface in Zendesk Support. Agents can delete end users while administrators can delete all users except the account owner. Zendesk retains information about the account owner to continue providing its services. When the account is terminated, Zendesk follows its Data Deletion Policy to purge remaining profile data. Only administrators can hard delete a user after they've been soft deleted. Make sure the user is in fact the person requesting to be deleted. The user is soft deleted, meaning the user is still in the Zendesk database and accessible on a limited basis only to Zendesk employees with certain database privileges. You can now permanently delete the user. 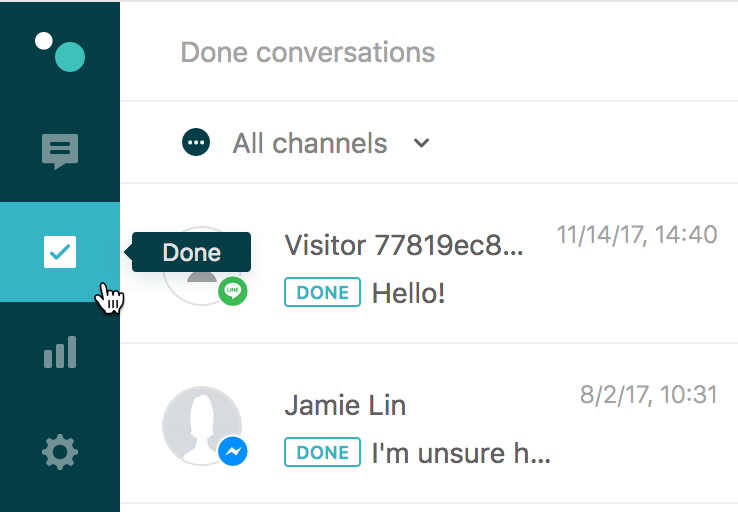 You can use the Zendesk API to find and delete an end user or agent in Zendesk Support, which deletes the user in Guide, Chat (for agents), Message, Talk, and Explore. A user must be soft deleted before you can permanently delete them.